Help! How Do I Lay Sod? First of all, remember that laying sod is hard work. For properties with more than 1000 square feet of lawn, it’s best to call a professional like Country Green Turf Farm who has the workers and equipment to make the job easy and efficient. Restoring grassy areas can be exhausting work for the inexperienced, and it can be especially disappointing to find that even installing sod in areas smaller than 1000 square feet can require multiple days do properly. However, we are more than happy to provide the supplies and tips necessary to make the job as easy and successful as possible for the DIY-er. We offer sod cut into 10 square foot rolls, 2′ wide x 5′ long. The minimum order for pick-up is 10 square feet or a single roll. The minimum order for delivery is 50 square feet or five rolls. For best results, sod should be installed in the milder months of spring and fall and watered in the morning. Professional lawn care companies have commercial-grade equipment that makes jobs like cutting sod much easier. Even though standard sod cutters can be rented from your local hardware store, they still require a significant amount of energy to operate. Homeowners are often surprised to find that a simple turf-removal job can take longer than what they scheduled the rental for due to the sheer amount of physical energy required. 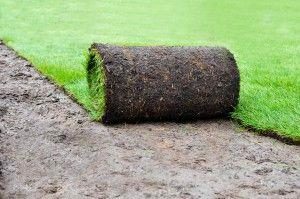 Sod is a form of grass that comes in sheets or rolls. It’s a lot easier to install grass using this method but for best results, must be properly cared for after it’s installation. Till – To install sod, the old turf needs to be removed with a sod cutter. 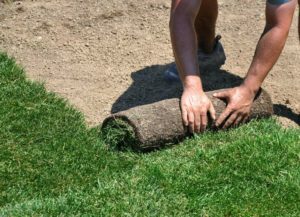 Then, the bare ground needs to be tilled about 6 to 8 inches down in order to loosen the soil and allow the new sod’s roots to establish. If the soil is mostly clay, it’s a good idea to add sand to help with drainage. Level and grade – The tilled area then needs to be leveled. Since sod is roughly an inch thick, the area should be graded accordingly. Be sure, also, to dig about an inch below the grade of adjoining paved areas. Pre-fertilize – To further encourage root growth, certain types of time-released fertilizer can be applied to the soil. Once the ground has been prepared, sod rolls can be laid. Edges should be staggered as well as trimmed in order to precisely fill the area. Be careful not to step on the newly laid sod. Use a rake or shovel to make sure no air pockets remain under the surface. After all rolls of sod are laid and cut, grab the hose. The newly laid sod will need to be watered right away. Water – To help the sod settle, and so the roots don’t dry out, the watering needs to be repeated one to three times a day for at least a week depending on the weather and sun exposure. After a week, watering can be cut back to every two days, then every three or four days, and finally once a week. During the hot months, it may require more frequent watering. Fertilize – After about three to four weeks, fertilize the grass. All the watering washes away the existing nutrients, so it’s important to keep it fed on a regular fertilizing schedule. Country green provides its customers with a starter pack of fertilizer specially designed for the type of sod mixture they choose and can provide additional supplies as needed. Monitor – As your new lawn establishes itself, monitor its moisture levels. Since it’s hard to tell visually, soil probes can be purchased to check moisture levels accurately. As a rule of thumb, moisture should be present 4 inches below the surface.